Don't wash affected areas of skin more than twice a day. Frequent washing can irritate the skin and make symptoms worse. Wash the affected area with a mild soap or cleanser and lukewarm water. Very hot or cold water can make acne worse. Don't try to "clean out" blackheads or squeeze spots. This can make them worse and cause permanent scarring. Avoid using too much make-up and cosmetics. Use water-based products that are described as non-comedogenic (this means the product is less likely to block the pores in your skin). Completely remove make-up before going to bed. If dry skin is a problem, use a fragrance-free, water-based emollient. Regular exercise can't improve your acne, but it can boost your mood and improve your self-esteem. Shower as soon as possible once you finish exercising, as sweat can irritate your acne. If you develop mild acne, it's a good idea to speak to your pharmacist for advice. Several creams, lotions and gels for treating spots are available to buy from pharmacies. Products containing a low concentration of benzoyl peroxide may be recommended, but be careful, as this can bleach clothing. If you have mild acne, speak to your pharmacist about over-the-counter medicines to treat it. If these don't control your acne, or it's making you feel very unhappy, see your GP. 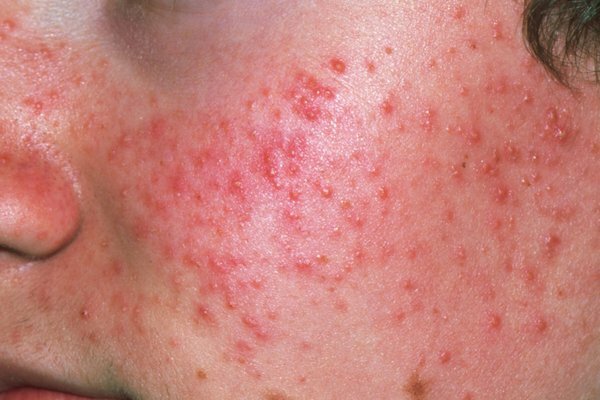 You should see your GP if you have moderate or severe acne or you develop nodules or cysts, as they need to be treated properly to avoid scarring. Try to resist the temptation to pick or squeeze the spots, as this can lead to permanent scarring. Treatments can take up to 3 months to work, so don't expect results overnight. Once they do start to work, the results are usually good. Acne is known to run in families. If both your mother and father had acne, it's likely that you'll also have acne. Hormonal changes, such as those that occur during the menstrual cycle or pregnancy, can also lead to episodes of acne in women. There's no evidence that diet, poor hygiene or sexual activity play a role in acne. Read more about the causes of acne, including some common acne myths. Acne is very common in teenagers and younger adults. About 80% of people aged 11 to 30 are affected by acne. Acne is most common in girls from the ages of 14 to 17, and in boys from the ages of 16 to 19. Most people have acne on and off for several years before their symptoms start to improve as they get older. Acne often disappears when a person is in their mid-20s.